On the whole, I used to hate breakfast food. I know, right? I think I was a little bit insane. In the past year or so something flipped and now breakfast is my favorite meal of the day. Especially when it involves fruit. And a lot of syrup. And a big cup of coffee. I had tried making vegan French toast before and it always just turned into a pile of soggy bready mush. Thanks to my favorite handy dandy cookbook, Big Vegan, I will (hopefully) never have that problem again. The secret, my friends, is a combination of nutritional yeast to make it have that slightly savory egg-y flavor and cornstarch to keep the milk mixture from dribbling everywhere. Voila! 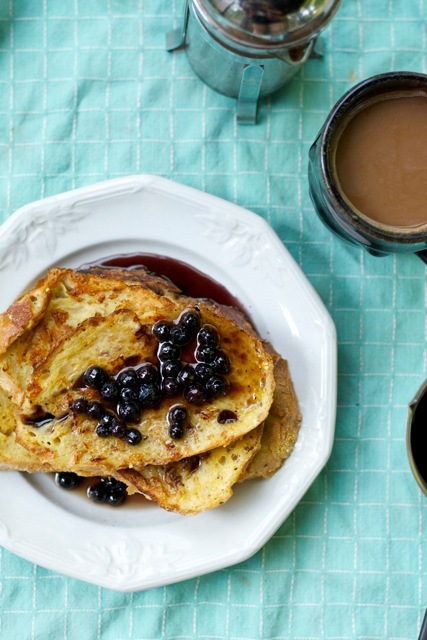 The perfect vegan French toast. My brother (the carnivore) said he couldn’t even tell the difference. Or enough for you to stuff your face and be full and happy for the rest of the entire day. Your choice. No judgment. 1. In a small saucepan, combine the syrup, blueberries and cinnamon over medium-low heat. Cook, stirring occasionally, for about 3-5 minutes or until the flavors have blended and the syrup is blue-ish. Set aside. 2. Mix together the milk, nutritional yeast, cornstarch, vanilla and cinnamon in a wide and shallow dish. Whisk until thoroughly combined. 3. Preheat a large skillet or griddle and grease with a little bit of canola oil or earth balance. One by one, dip each piece of bread in the milk mixture, really soaking it up with both sides. Once the skillet or griddle is hot, cook the bread on one side until it turns golden brown (about 2-3 minutes) and flip, letting the other side brown. Repeat until all the bread is used up. 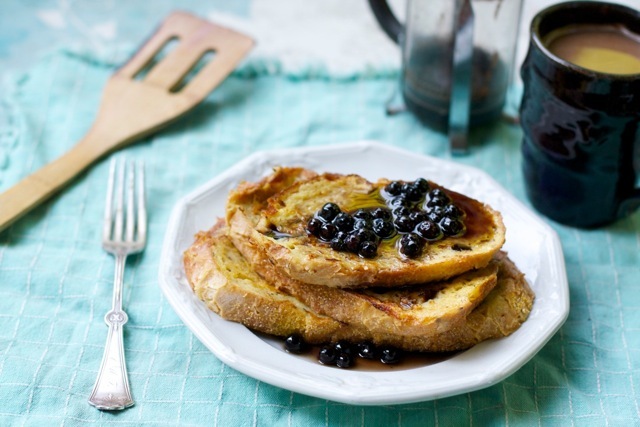 Serve with a generous amount of blueberry syrup and enjoy! So glad there is no judgement for face stuffing. These look so delicious I am not certain I would share! Yum! I can't comprehend how anyone could ever hate breakfast foods! They have always been my favorite. I use to BEG my mom to make breakfast for dinner several times a week growing up. I don't really know what was wrong with me... I think part of it was I didn't have as much of a sweet tooth as I do now! I'm totally with you these days, though. Using nooch to make it eggy tasting is such a great idea! My fool proof recipe is to dredge the bread in a mixture of vegan yogurt + whatever spices I wanted that day (usually just cinnamon & ginger). I'll have to add a little nooch next time to see how it tastes! 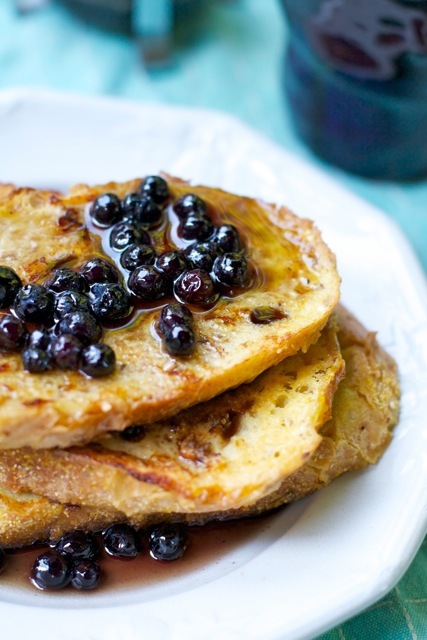 This looks so great...I never thought I'd eat french toast again! And I would have never thought to use nutritional yeast!! Looks amazing, thanks for sharing! Thank you, Stephanie! I know what you mean, I was really missing french toast for a while. This recipe saved me! 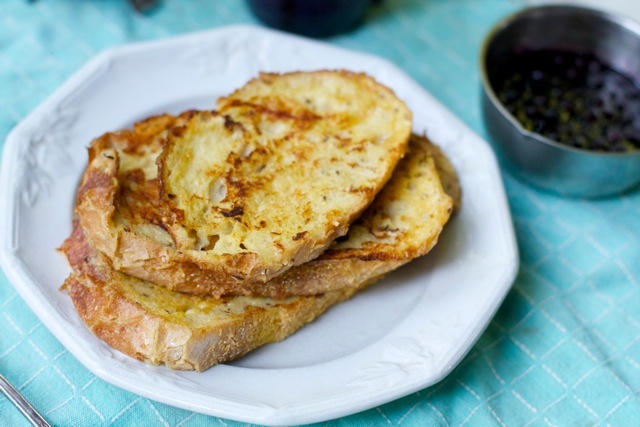 I've been looking for a good egg-free french toast recipe for a while now. Thanks! I really enjoy reading your blog, and I have nominated you for both the Versatile Blogger Award and the One Lovely Blog award. Please go to my site to check out the details! http://livliveslife.wordpress.com/2012/06/25/i-owe-you/ ! These came out so so so so well! It's such a simple batter-- and using nooch is seriously genius. I didn't have any blueberries (or maple syrup for that matter) so I made a strawberry agave syrup, which I think did the job just fine. Thanks so much for the recipe! I'l definitely be making this for my roommate. All images and text are the creative property of Ruby Smith. If you would like to use or reference anything from this site, please contact the owner first.